Few decisions you will make rival the importance of a home sale or purchase. When the time comes for you to make your real estate move, call on Jane to be the one you can count on during this critical moment. Her goal is to connect you with the right results in your next sale or purchase. To order any of the following complimentary reports, just check the box to the left of the title and click "Send Me" at the bottom. You will then be prompted to enter your mailing information. Jane will send you the report(s) of your choice once she has received your request. 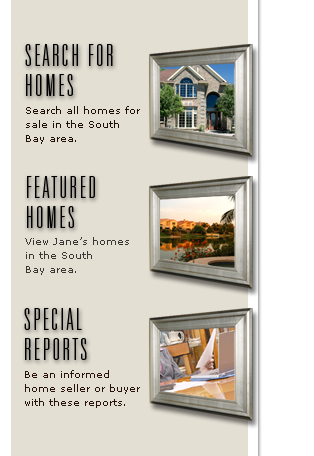 Ask for Jane's report to get a jump on the best values. Call or e-mail her today! This important information can make a big difference in understanding the value of your home. Don't be left uninformed!